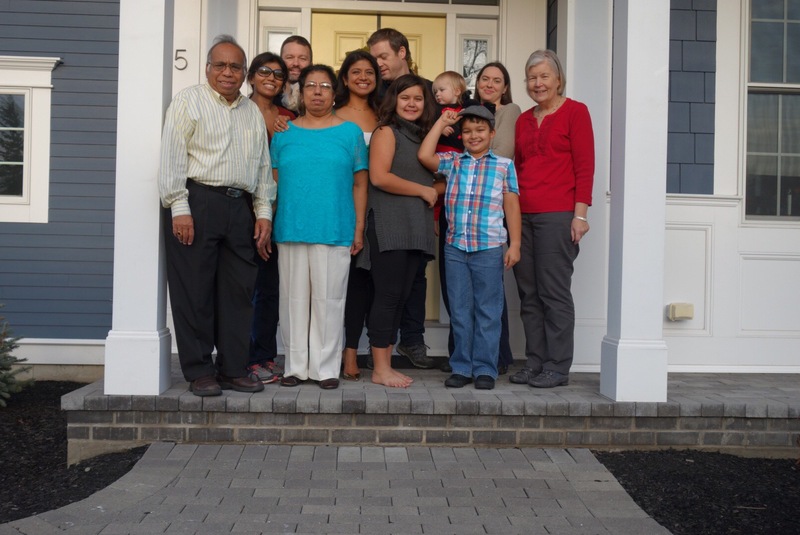 Here’s to all the Lead Parents, the co-Parents, and the Village it takes to Raise a Child. I get the working mom dilemma. I am a mother and I work the hourly equivalent of 3 full time jobs. I get it. It’s hard to do it all. And sometimes the tasks involved in either or both are just not that much fun. Though I have never been a stay at home mom I suppose this is why many call this the hardest “job” of them all. It’s not all coos and snuggles. Parenting can be onerous. But every time I hear a working mom athem or a stay-at-home mom anthem I feel sad for everyone who is left out, or worse, by implication, accused of not being able to or interested in parenting. As far as I can tell, other than gestating and breastfeeding, men can do every bit of parenting – the good and the bad, the fun and the tasking, the easy and the hard – that women can. And, just ask any adoptive mom or mom through surrogacy or step-mom and she’ll probably tell you that those to bio/physiological processes aren’t requisite either. To be sure, I too am guilty of getting caught up in the mob mentality of the “moms have the hardest job in world” even though my husband does the vast majority of parenting in our household. We do nothing but reinforce old stereotypes about gender roles with tales of the plights of moms. These are plights shared by all parents. Single parents. Gay parents. Heterosexual parents. Widowed parents. Each person’s role in the day to day tasks of parenting will vary. Sure there are deadbeat dads (and moms!) out there and, without congratulating them on their parenting failures, let’s just agree that the definition of an involved parent will vary based on a number of complex, overlapping factors ranging from natural affinity for children to income potential. I understand that statistically the bulk of childrearing in our society is provided by women. 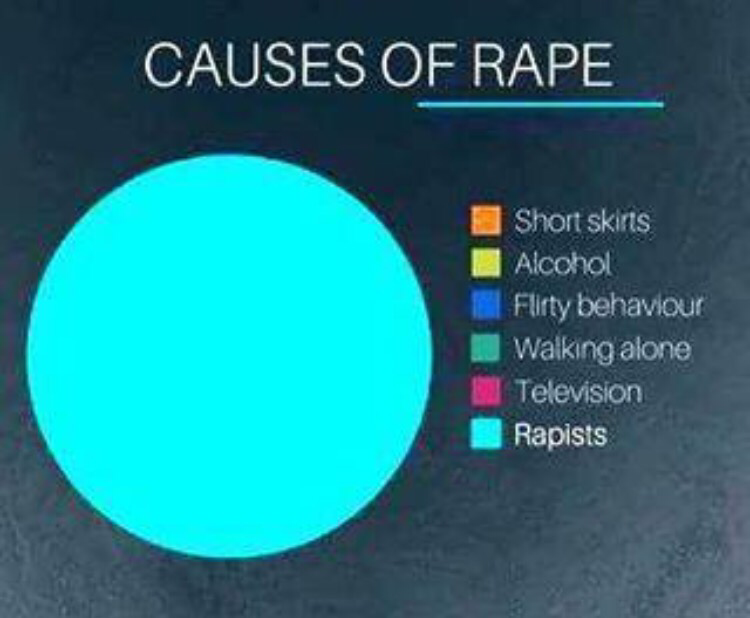 Social norms, cultural discourse, and possibly some biology are at play in determining this statistic. But, as a woman whose children have been well-reared by a devoted lead parent (who happens to be my male heterosexual partner), four healthy-able bodied grandparents, and a neighborhood of friends who I trust to nurture and admonish my children, it just makes me cringe when a mixed audience of dedicated parents is subjected to a “The Hardest Job is Being a Mom” mantra. Parenting is hard no matter who does the parenting. It’s also filled with incomparable joys. So hats of to to all the lead parents, to the co-parents, to the moms and the dads, and to the various villages who are doing their best amidst the ups and downs to raise a child in our modern world. We had a lovely still “cool” looking Yukon Denali to which I just had to say “goodbye”. Why is it my husband’s fault you ask? He’s 6’6″. And, well, because we found out last week that a car seat will not absolutely, positively, in any way, shape, or form, fit in a seat behind my husband while he is driving. This would then relegate my three year old to the third row meaning someone (me) would be required to gracefully (insert eye rolling emoticon here) climb back to the third row every. single. time. to buckle him in and out of said car seat. Oh and yeah, say goodbye to any cargo space for anything other than an umbrella stroller. Fast forward to two days ago, when my husband walks into the minivan dealership and loudly proclaims,”This must be what a dog feels like on his way in to get fixed. You guys got accessories? I mean, if we are going down, we are going to go down fighting! Chrome wheels? No? How about 22’s?”. For real, peeps. This happened. So, we are now the semi-proud owners of a new Honda minivan. But in keeping with the chrome 22’s theme, I have set the Ode to my Odyssey to the tune of that ever classic, ever catchy tune, Snoop Dog’s “Gin and Juice”. But (but what) they don’t look cool and so? Can this child learn emotional awareness? When I talk to surgeons and other trauma care providers about burnout, I tell them that the first step avoiding the emotional exhaustion, depersonalization, and a low sense of personal accomplishment characteristic of burnout is to be emotionally aware. I make my audience stare at an empty black slide and ponder their emotions to explore how those emotions are impacting their impression of their day, their reaction to my talk, their distractions. 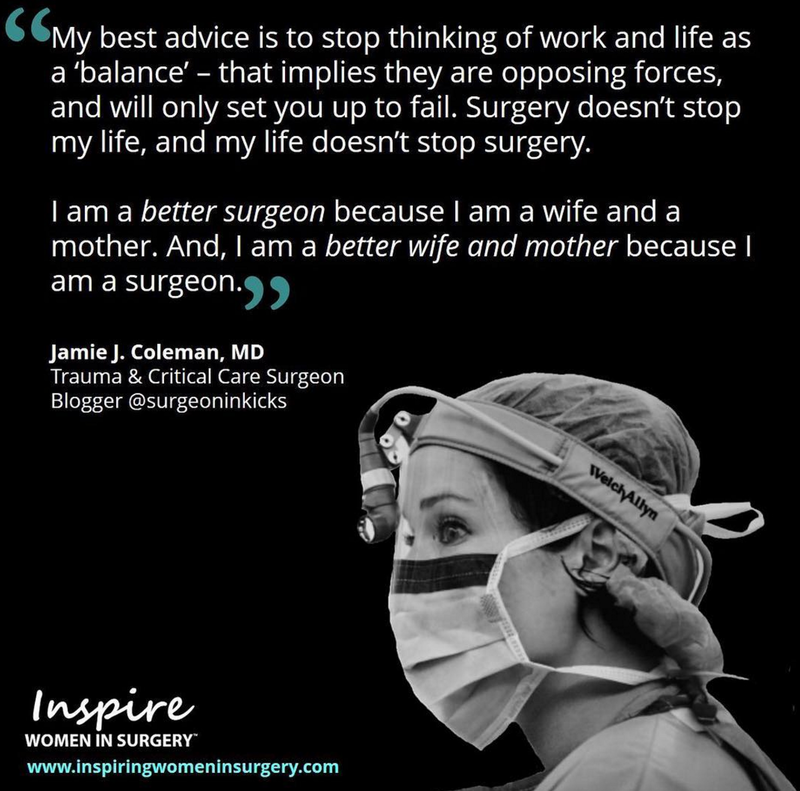 By the end of the talk, most in the audience know that the surgeon who flips out and throws things in the OR is not emotionally aware. The surgeon who goes home and gets into a fight with his/her spouse over some totally minor household to-do item because he/she had a long day and someone died and the work to-do list is getting out of hand is not emotionally aware. The surgeon who turns to alcohol or drugs to get through his/her days/nights is not emotionally aware. And it occurred to me, as I was still reeling from and strategizing about what to do about our son’s recent behavioral issues, that my 8 year old has no emotional awareness. Whether it’s about brushing his teeth before going to bed, or wearing long pants when the temperature is below freezing, or losing a board game to his sister, anger and frustration drive his immediate response. Though the response is the opposite when he is excited about something, the effect is the same. His boisterous enthusiasm about getting picked to use the iPad in class, or lining up to see the neighborhood haunted house, or getting the gift on the top of his wish list under the tree on Christmas morning results in disrespectful acting out. Whether he behaves like an angry petulant child or a boisterous obstreperous child, his emotions, in the absence of any emotional awareness, are driving him. I say “he behaves” rather than “he is” because I am convinced that he’s a balanced kid on the inside. He just needs to become emotionally aware and behave in a way that is safer and more socially acceptable. 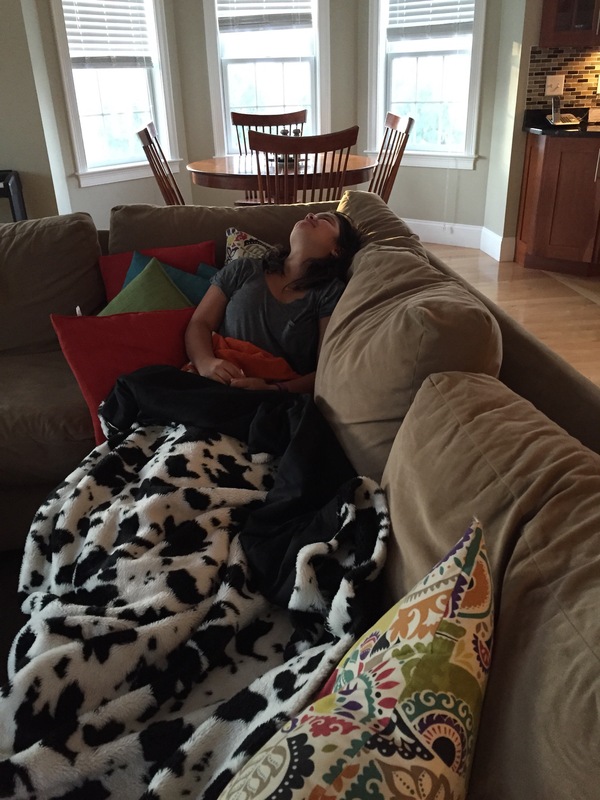 So here is what we have done as parents to move toward a more emotionally aware child. We don’t ignore the minor transgressions. It’s easy as parents to zone out on the cacophony of kids. But now, when we hear a cupboard slam (because his favorite cereal is out) or perceive a wrecking ball to a lego structure (because it just wasn’t coming together the way he wants), we remind him that this is the kind of behavior we are now discouraging. If he learns to manage his emotions with the little things, he will be more like to do it with the big things. We are talking a lot more about feelings. When he acts out or appears as if he is about the act out, we bring him to a full stop and have him verbalize what he is feeling, what is driving him. Often he does not know, but having him pause is helpful. And if he can put his finger on it, giving him the chance to bounce his feelings off of us validates his emotions while reigning in his destructive responses. Now that he is aware that he has a physical response when he is frustrated or disappointed or angry he can work on ways to contain he outward behaviors. We have taught him how to slow down and take deep cleansing breaths when he feels his emotions getting the best of him. If we are near, his slow deep breathes are enveloped by a giant loving bear hug. If we are far, he squeezes a stress ball which he can find in his back back, or desk at school, or in various places in our home. While these reactions in the moment are important, our son needs to learn a more constant sense of emotional awareness. Therefore, we are finding calming activities which had been increasingly absent as he grew into boyhood. My son now spends much more time coloring “adult” coloring books, working through origami, sewing, crocheting, balloon sculptures, and gimping. He was forced into these activities nearly full time during a 34 day period of “house arrest” following his misbehavior on the eve of Halloween. Putting his hands to work in a quiet, non-competitive way has been incredibly effective in allowing him to remain calmer, more centered, more contemplative when his is back to playing with his buddies. Meanwhile, our newest adjust is practicing mindfulness and meditation via several apps we are currently sampling. It’s been 3 months since the epic transgression leading to our son’s loss of Trick or Treating. We are proud of his progress so far. We are proud of our progress as parents of a child who can, in fact, learn emotional awareness. We are simultaneously monitoring our own emotional awareness with higher acuity. Whether the stressors are at work, or from a spousal disagreement, or related to raising an 8 year old, we are hyperaware that how we manifest our anger or frustrations influences what our child feels is acceptable. Therefore, we are challenging ourselves more than ever before not to fly off the handle but rather to be the kind of emotionally aware, present parents our rambunctious young man deserves. I am sitting here on a plane crying. I just don’t feel like leaving my son today. He is 8 years old. He is generally a good child. He does well in school. He devours books. He enjoys math. He is just as likely to break into dance as he is to play. He is obsessed with all sports and loves memorizing stats and reading biographies of famous athletes past and present. 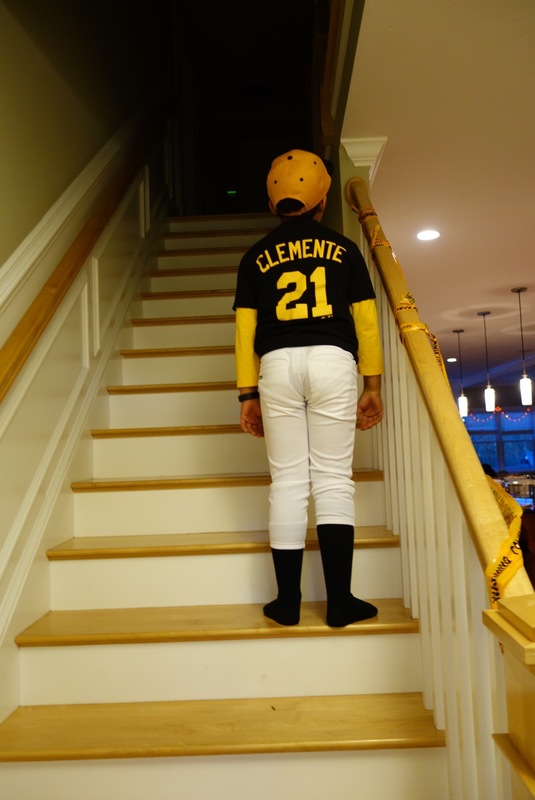 He studied every detail of Roberto Clemente’s life story and picked this as his Halloween costume. He was so excited for weeks as each piece of the costume arrived. My son is outgoing and has always been the boisterous one in the crowd. He has lots of friends. So of course he was over the moon excited to go out with them in his costume last night. Whatever our criticisms of Halloween may be (it’s a made up holiday, it encourages unhealthy eating, it exemplifies our society’s socioeconomic divides, getting dressed up in costume is just stupid…) the thrill of kids on this day (before they hit the sugar feuled meltdown anyway) is a joy for parents to witness. And last night my husband and I had to deny my son that experience. He will grow up some day and may read this and so I will be purposely vague on details here. And I know he already feels so bad. But, suffice it to say that his behavior the last few weeks in terms of respecting others has been deficient. The poor boy feels terrible afterward each incident buy can’t seem stop it from happening in the first place. We have had three episodes of disrespectful behavior in as many weeks. Despite his obvious remorse for his most recent transgression, we couldn’t just let life go on as usual. He needed to be sternly punished. So we took away trick or treating. He sobbed in his room for hours leading up to the evening. He paced the yard while all the other kids came to trick or treat at our door. It was a tough night for him though he finally did settle down to enjoy a neighborhood party we hosted afterwards. Still the heartbreak in his eyes when the other kids were trading their candy was hard to witness. It was so hard to stick to our guns yesterday. And today, when I walked by his open door and saw his uncovered pillow since he had taken off the pillow case first thing yesterday morning for his candy bag, I just lost it. Now I was the one sobbing while he was calm and introspective this morning. Today, he did not seem mad at us anymore. He expressed understanding of why we did what we did and what he needs to work on in the coming days, weeks, and months to regain our trust. But my heart was still breaking for having robbed him of that stupid made up experience that would have made him fat and rotted his teeth. It was an appropriate punishment but I still feel awful. As I fly away with the poor guy in seat 21B wondering why I am sobbing, I feel awful that my typically rambunctious yet sweet boy is acting out. I feel worse that I won’t be spending the next few days with him to help him sort through his feelings and strategize about how to behave better from now on. Whatever parenting pride I had yesterday that we stuck to our guns and rendered a swift and appropriate punishment is gone now, replaced by the emotional pain of a really hard moment in tough love parenting. Hoping this feeling and my son’s misbehavior will be a thing of the past soon.